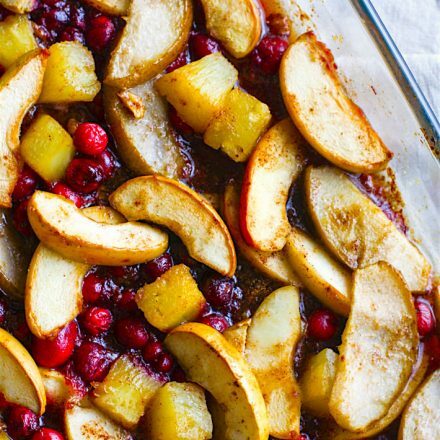 Spiced Hot Fruit Bake is a delicious and healthy holiday breakfast! This gluten free spiced hot fruit bake also makes for a great topping for waffles, pancakes, or simply by itself! A nutritious dish to add to your Holiday Brunch menu. Easter, Christmas, Mother’s Day, or New Year’s brunch. Vegan option too. Hey friends! I hope your enjoying the Holiday season so far! 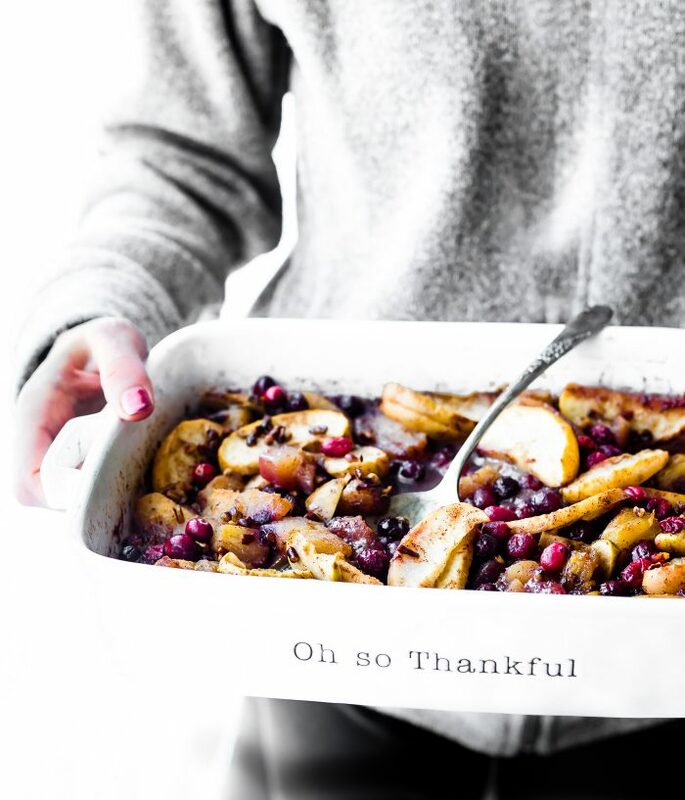 Just letting you know this vegan Spiced Hot Fruit Bake recipe was originally published in December 2015. I retested and updated content and photos. I really wanted to re-share this goodie of a Holiday recipe because it makes an amazing brunch recipe, dessert, or breakfast topping. Heck, I make it year round! I hope you don’t mind me republishing. Thank you for following Cotter Crunch Y’all! Reason number 524,600 I love Christmas… THE SMELL! You know, the smell of spices, the smell of christmas morning breakfast.. ahem cinnamon rolls and egg casserole and um.. Christmas brunch Cranberry Almond Cake! And being married to a Kiwi, I get re-live all these “Christmas Smells” with him. It’s summer season during Christmas in New Zealand. Hard to really enjoy those cozy spices or winter fruit when it’s 95F. Right? Haha. So today, it’s all about bringing back the nostalgia via food! Specifically, spiced hot fruit bake! A family favorite around here. My mom used to (and still does) make spiced hot fruit bake for Christmas and New Year’s brunch. Although, in the south, we call it Hot Alabama fruit. Don’t ask me why, I guessed Alabama or claimed it first. Haha! Actually, I’m thinking it’s because this traditional southern spiced fruit bake is more butter and sugar than fruit. We Southern’s love our buttah! I’m a southerner, I know this! I know, gasp! Southern folk will disown me, once again, for healthify-ing a dish. But hear me out, because you’re gonna like this. 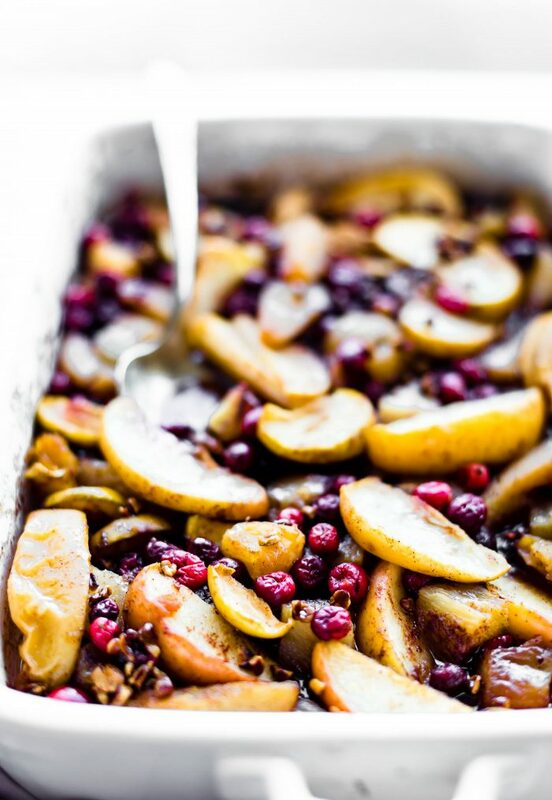 A hot spiced fruit bake that taste so rich and buttery and sweet and smells like Christmas. Please excuse my run on sentences, but I can’t help but exaggerate this dish. 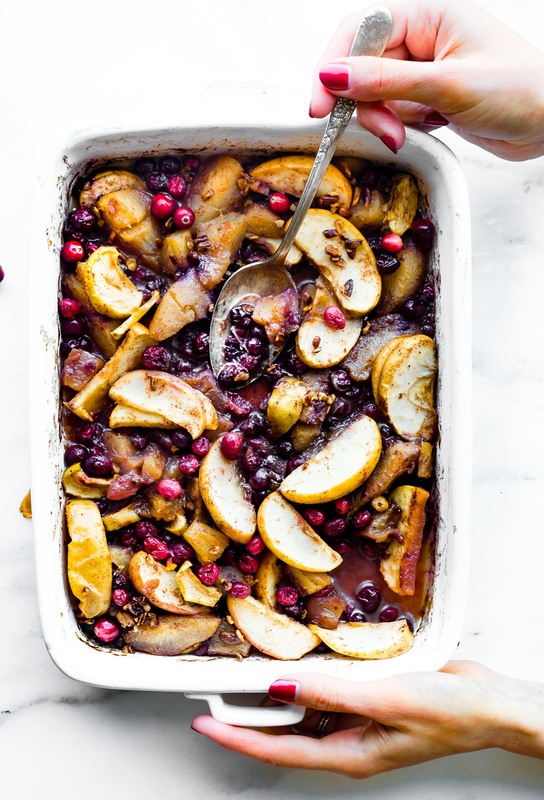 This fruit bake, it’s simple really (much like my caramelized apple cider fruit bake). The key is to have the right amount of extras and the right ingredients. Fresh seasonal fruit and seasonal spices. Such as pears, apples, cranberries, cinnamon, nutmeg. etc. Mmm… can you smell goodness? Now.. to make it we need to mix the fruit up with spices, a little coconut sugar, and just a little (or more) of melted butter, or coconut oil or vegan butter (for the dairy free option). 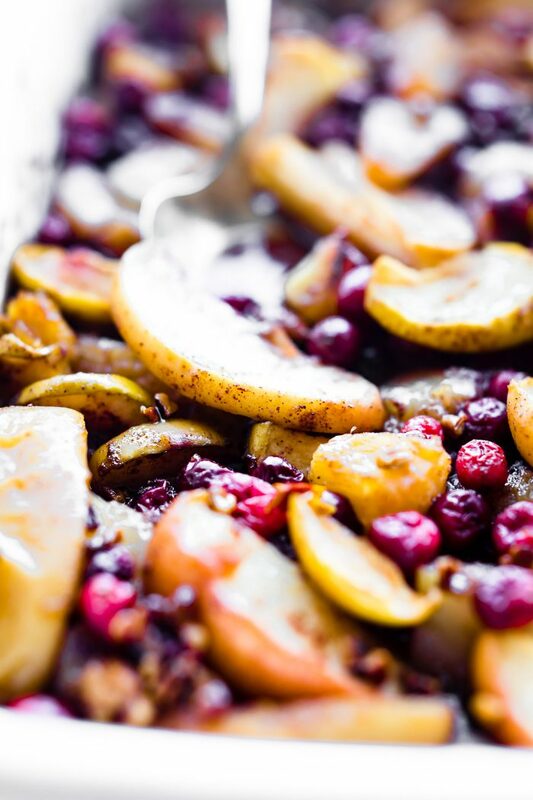 Toss in some some toasted nuts and WHOA… you’ve got yourself a spiced hot fruit bake that tastes like dessert, but isn’t. In a large bowl, toss your fruit and add in 1-2 tsp lemon juice. Set aside. In another glass bowl, combine your melted butter, spices, and honey or maple syrup. Mix in a few tablespoons of your leftover pineapple juice as well. Add this sugar/butter mixture to your fruit and coat evenly. 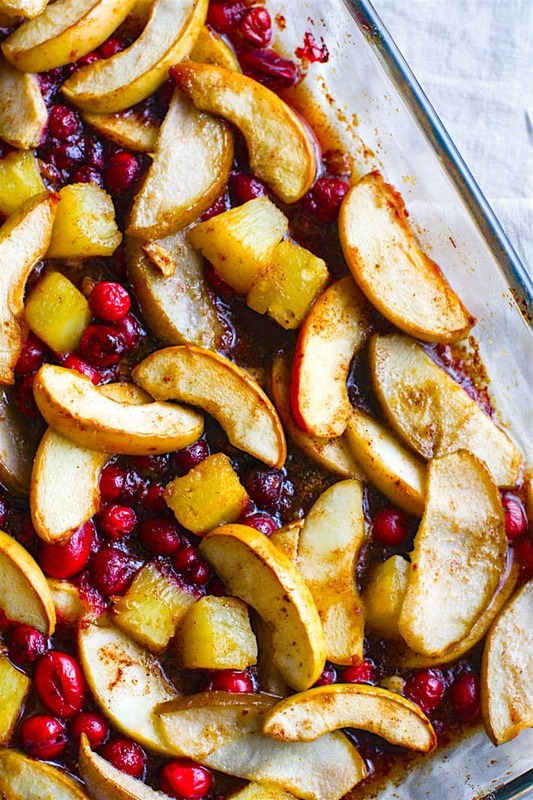 Pour fruit evenly in a 9×12 baking dish. Pour the leftover sugar/butter/oil mixture on top. OPTIONAL – Toss your nuts in a tiny bit of melted coconut oil or butter and pinch of cinnamon. I usually just coat the nuts in the leftover butter/sugar from the fruit mix bowl. Then sprinkle the nuts to the top of dish and bake all together for 1 hr. 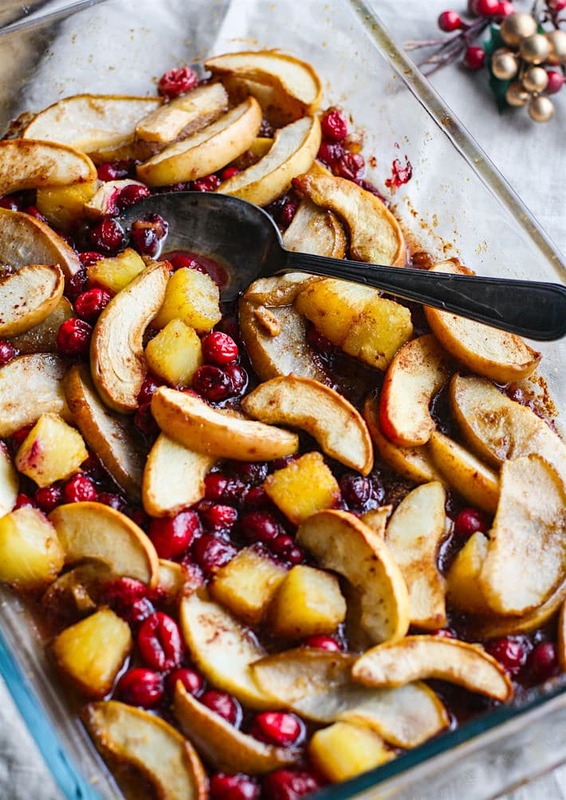 Sprinkle any additional cinnamon and spiced over hot fruit bake before serving, if desired. You can prep this dish the night before and baking the day of. There are a few ways. Option 1: You can mix everything, place in casserole dish, place in fridge, then bake the next morning. Option 2: The fruit is is more bright and crispy if you mix the fruit in lemon, place in a large dish, cover. Then mix the melted butter, sugar, spices in another bowl. Place that in fridge too. In the morning, reheat the butter/sugar mix and pour it over the fruit. Then bake. Option 3: Bake everything the night before and then simply reheat for 20 minutes at 300F before serving. To save on time, feel free to use canned pineapple and pears (in water or juice), drained. Ultimately, you can’t go wrong with whatever method you choose. All delish! The great thing about this type of breakfast bake is that it can be used for so much more than just Holidays. 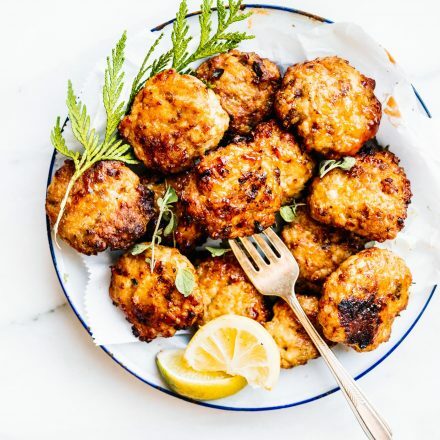 It’s great with yogurt for a post workout meal because hello…. the perfect balance natural carbohydrates, glycogen, and protein from the yogurt! Can you just imagine how good this taste after a run in the cold? SO GOOD! Hot fruit bakes are great for potluck parties, brunch, New Year’s, or Easter. Okay, I’m getting way ahead of myself, but you get my point here. It’s a keeper! Plus it’s naturally gluten free and paleo(ish). Or you can make it vegan by using melted vegan butter! I will admit, I tried it both ways, and I although I tend to be a real butter kind of girl, the vegan option was super buttery tasting as well! I had my family taste to see what that thought. And it’s a good thing because they all said, “This tastes like mom’s spiced hot fruit bake!” Little did they know I made it with unrefined sugar. GASP! Should I tell them? Let’s just breathe in the aroma that is CHRISTMAS and call it a day! Favorite Holiday Smell? What do you make on Christmas morning? This is a dessert I would love. And even better, my family would to! Now this I love! I bet it would work well in the crockpot too. totally works the crock pot! YEA! How long do I cook in a crockpot? I haven’t tried it yet but I would try it on high for 90 minutes to 2 hrs. Check after 45 minutes. Does that make sense? Or low for maybe 3? pretty much 95% of the reason I make it! oh yay! let me know if you do. And invite me to your holiday brunch, mmm k? My mom actually makes something similar to this but it’s in the crock pot but it contains lots of canned fruit because it’s a really old recipe. Canned fruit doesn’t compare to fresh fruit, period! this is why this version looks so much better and more beautiful! Gahhh you’re so right–the smell of Christmas is the best smell which is why I may or may not light a Christmas-scented candle randomly during the summertime… 😀 Beautiful photos too! haha same! it’s the best! summer smells can’t beat it. Yum! This looks amazing! I’m a huge fan of all Christmas smells. I just got some soap that smells like Pine and it’s wonderful!! PS. we had your one post honey chicken last night and it was so tasty! yes!! i just made that again too! So good! Yum I can just imagine this on top of my pancakes – what a fantastic brunch idea! But melting some vanilla ice cream on top seriously looks amazing, might just have to combine them all and do ice cream for breakfast- you get to break the rules for the holidays right? I was just thinking to bake a dough for it but your idea is great pancakes and vanilla ice cream, yummy! I love that this dessert is bursting with so much fruity deliciousness!!! Oh the smells of the holiday season are so delicious! And I can practically smell this from my computer! Can’t wait to try it. And how do we feel about leaving the butter out? No butter at all? Or just coconut butter? It will not be as moist but still tasty! 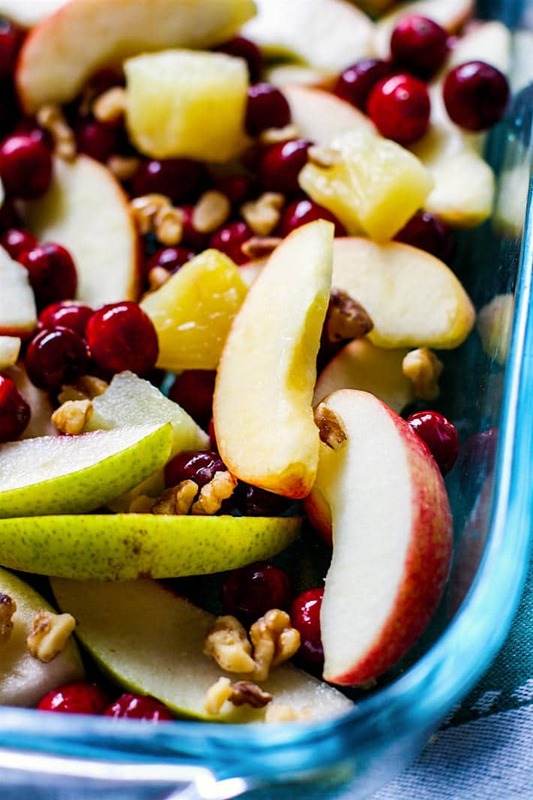 OOOH we often do fruit salad on Christmas Morning, but this could be a great new twist! YUMMMM! This looks SO. GOOD. I can almost smell it through my screen. Love how easy it is, definitely adding it to the list of things to make this holiday season! I agree! The smell kinda is one of the BEST parts! Hahaha! Oh yes the smells of Christmas and Christmas season!! I could eat the whole thing myself! On top of pancakes, topped with granola, with yogurt, with oatmeal, by it’s self… but would it ever make it without me testing it the whole time since I would be so tempted by the smell? 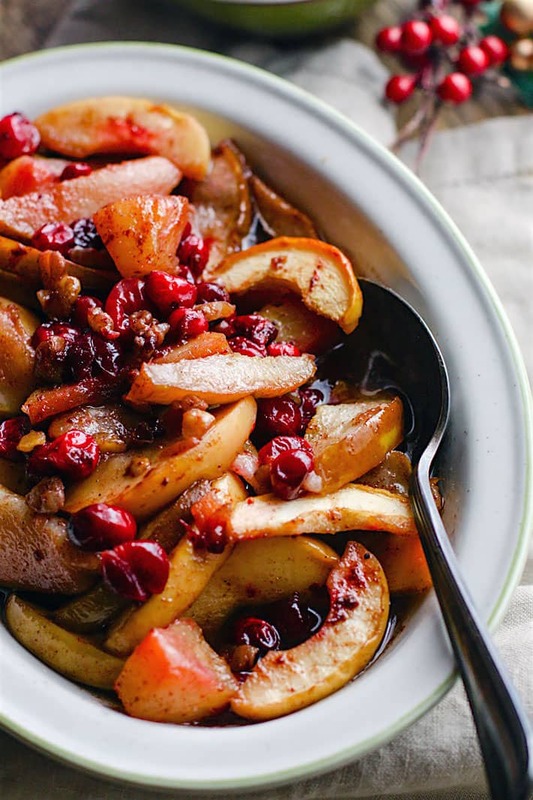 I’m all for you healthy-fying a traditional dish and this looks so festive! My parents used to make Sri lankan Christmas cake and on Christmas day we used to “unwrap” it – and that smell was Christmas for me! This year I’m attempting to simplify my moms recipe some – it if comes out ok, I will post it. yea! let me know how it turns out! This is so great for the holidays! I like how the I’ll be able to adjust how much sugar I put in it and the use of all fresh fruit (no to canned fruits!). I’ve been making a lot of overnight oatmeal lately, and I think this would be a nice topping to go with it. yes, that’s what i liked too! let me know if you try it elle! I can’t get enough pears this time of year. They’re stupendous and I even have my own pear recipe to share, provided I ever get the thing photographed. Damn darkness at 4:45 p.m. In the meantime, I shall ogle your glorious creation. My family has a giant fruit bowl at every family meal. It’s a prerequisite. This looks like the perfect dessert on a cold winter day. Love the spice. so is! and i bet it’s cold in Canada, right? stay warm friends! I love this healthified version of Hot Alabama Fruit! Yummy! I am totally making this when my girls get home from school today! I can’t wait for the house to be filled with the scent. Mmmm. Who needs scented candles when you can just work some magic in the kitchen and make your house smell -amazing-, eh? 😀 Smells are definitely one of my favourite things about Christmas, especially when I go over to my parents’ for dinner and the house smells like I remember it from my childhood. That looks so amazing!!!!!!! I love the smells of this season – cinnamon, molasses, gingerbread.. all so great! From one southerner to another, THANK YOU! I can definitely appreciate a dish that’s not laden with extra butter and sugar! I always make homemade cinnamon rolls for Christmas morning, but I think these would make a great addition! I totally agree with you- it’s crazy how much sugar is often added to fruit based dishes! This looks like the perfect balance. it so is! thanks laura! Made this…sort of. I like the idea of all the yummy spiced fruit but why do people feel they need to add sugar and fat to everything?! Fruit is so sweet on its own, especially when you bake it. So I made this without the butter and sugar and honey and oil saving 100s yes 100s of calories. Think about it, 1 tbsp alone of butter is 100 cal and sugar is pretty close to that as well. Adding all that sugar and fat is unnecessary and horribly bad for you. Please also note pop up ads on a website are evil. Sorry about the ads. Didn’t know they were pop up. And yes, you can totally enjoy without sugar. Glad you did! I made this as a topping for waffles. I really underestimated this recipe. I didn’t think it would be that good but this goes to show how roasting really does bring out the best of not only vegetables but fruit too! Isn’t it? and the smell alone is divine!! so glad! 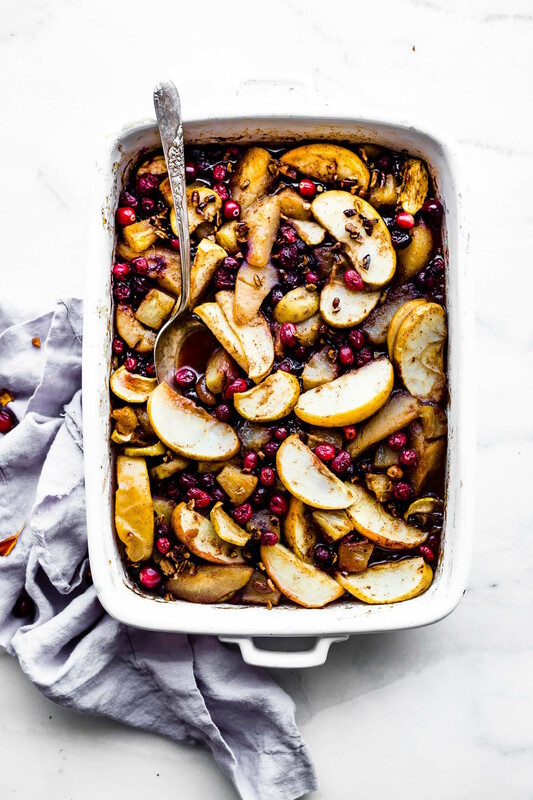 i have another apple cider caramel hot fruit bake sharing soon!! another one to love! I need to make this! It will be perfect for the cold winter days! Can’t wait to try this amazing colourful fruit dish, nice to serve with warm breakfasts especially with my favourite oatmeal pancakes. yes! so great on pancakes, waffles, and more! let me know when you try it! Do we need to put some anti-stick spray on the pan before baking? Not really, but you can if you want to be safe. There should be enough juice to keep it from not sticking though. I liked the idea of this bake, but why you would add all that sugar and fat is beyond me. To keep this healthy, as fruit should be, do not add sugar or butter or all that coconut fat!! I used 1 tbsp honey and 1 tbsp coconut the first try, but I don’t think I’d add either next time. When you bake fruit it just becomes sweeter!! This did make my house smell amazing. I totally understand! And you can definitely adjust the sugar intake. THe funny thing is that I actually reduced the amount of sugar I used for this recipe. I tweaked it from an old family recipe. Oh goodness, they use over a cup of sugar (processed) back then. Haha! But feel free to adjust as needed. Thank you for feedback! I have some pears in my refrigerator that I was just wondering what to do with. Now I know! This looks amazing. Thank you for sharing! i would like to try it someday, if i have a time.. I fixed this for a Christmas get-together last year. It’s already been requested for a repeat performance this year. Thank you so much for sharing! Oh I am so glad!! it smells heavenly, doesn’t it? This looks fantastic! I am hosting a holiday breakfast and would love to include this. How early do you think I can make this and have it still turn out looking and tasting as good as yours? Do you think I can make it the night before the breakfast and then warm it up that morning? Have you tried that? Thanks! totally! I think the night before should work great. Although, it smells so heavenly that i love baking it before guests arrive. Seriously SOOOO GOOD! haha. This looks delicious! It came up on a search for low calorie cottage cheese pancake toppings! I’m trying to lighten it up a bit, any ideas for substitutions for the butter and sugar? Also sounds great on plain greek yogurt or oatmeal! sure thing! 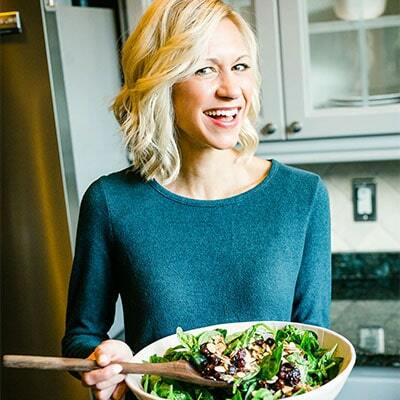 Are you looking to cut back on calories or fat? This looks amazing! I would love it over vegan vanilla ice cream! HOLY YUMMINESS!!!!!!!!!!!!!!!!! I love the smells & scents of this season!!!! Yup, my house never smells better than it doesn’t during the month of December – cookies and spices and all those wonderful things! And I bet this would make it 100X better. What a beautiful, healthy breakfast/brunch for the Holidays! Looks like dessert for breakfast, love this! This qualifies for dessert or breakfast in my book Lindsay! It looks cozy, warm and delicious! This is so pretty! YUM! Such a beautiful dessert for this time of year! Totally loving the sound of this! Fruit anything is always delicious! I bet this fills the kitchen with the most wonderful scent!! 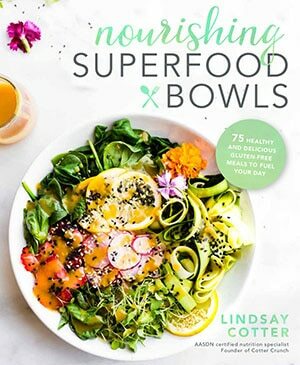 Looks so good, Lindsay! I want to make this ASAP and I want my whole house to smell like this baking! This is the ULTIMATE comfort food—so warm and cozy!! This looks and sounds amazing! I’m going to make it for breakfast for dinner tonight! Do you think this would freeze and reheat well? My mom-in-law is not well and when we find foods she loves, we freeze in individual containers so I can easily reheat for her over the next few weeks. This is something I think she’ll love and I’d love to have it on hand for her! I think so! Are you using fresh or canned fruit? I would reheat in oven and add a bit of more spice or touch of coconut sugar when you reheat. I’m using fresh except for the pineapple. I’ll give it a try and let you know how freezing and reheating works! I’ll do it in the oven when I reheat for sure! It’s in the oven now! Can’t wait to try it! OK, I’m stuck. I haven’t any pears – canned or fresh. What do you think about adding tiny cubes of fresh sweet potatoes? I’ll take any other suggestion anyone may have for a pear substitution. just emailed you. What fruit do you have on hand? Any stone fruit? 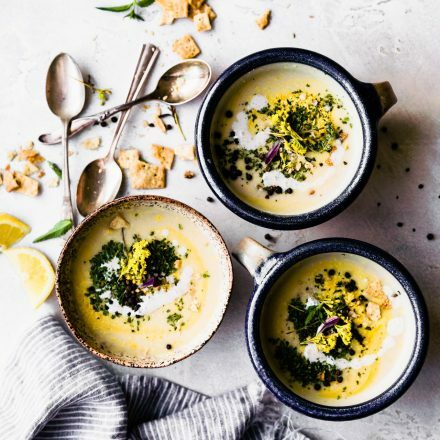 We tried this recipe for breakfast during the holidays and it was delicious. Can’t wait to have it again next holiday season.Thanks for the recipe! Nice! Will make this to serve with ice cream. I bet it will taste absolutely delicious. you betcha! one of my favorite ways too! 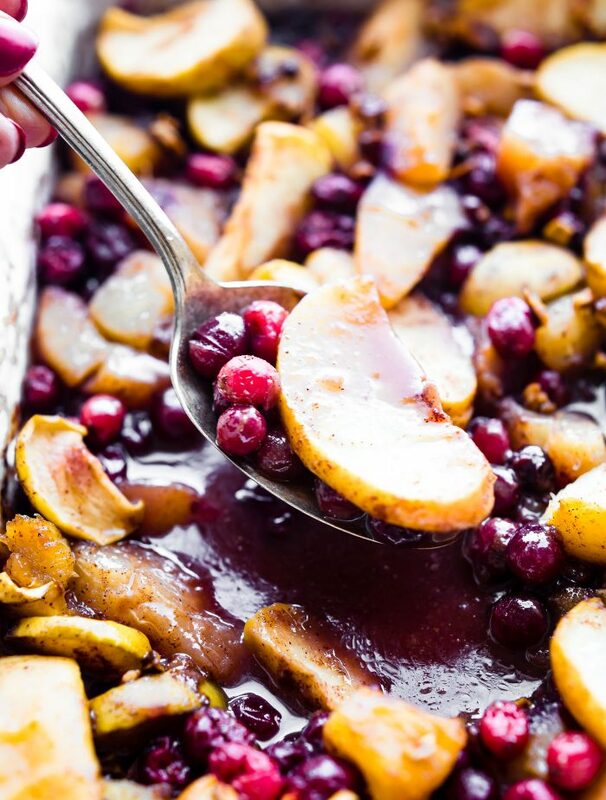 Hands down my favorite “fruit” dish for Thanksgiving or Christmas! Oh wonderful! Yes I would serve with a pound cake or angel food cake. 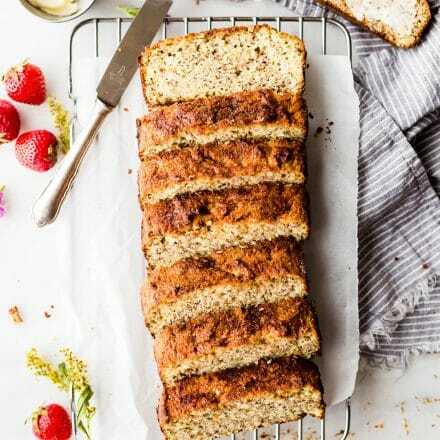 Are you looking for a gluten free cake recipe? This sounds delicious. Can I substitute something for the pineapple? My daughter-in-law is allergic to pineapple. sure! can she have mango or papaya or any other tropical fruit? I’m thinking oranges (canned) might work too! I can’t wait to make this for our Christmas breakfast party! Can I use coconut oil in place of the butter? 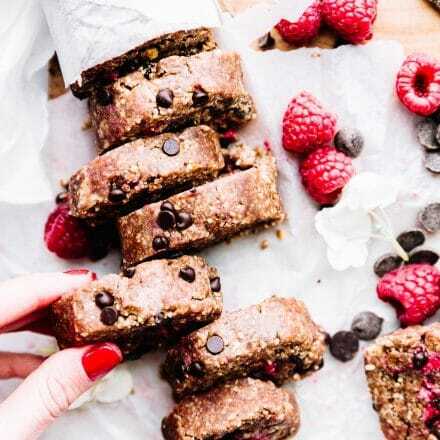 Thanks for sharing this delicious looking recipe!! yep! totally can. Except I would get the coconut oil that stays as liquid. like an MCT or refined. It will harden when cooled. Still tastes great, but you dont want that chunky coconut butter taste, ya know? This is SO delicious! I planned on making it as dessert (served with vanille ice cream) for Christmas Eve, so of course I had I trial run and I absolutely love this. It looks and smells so festive too! Thanks for sharing. This is my second Christmas making this to go with our family breakfast. It is heavenly! Pro-tip: It’s amazing over cinnamon rolls! OH that’s genius!! Thanks for the tip Victoria! LOVED this recipe! 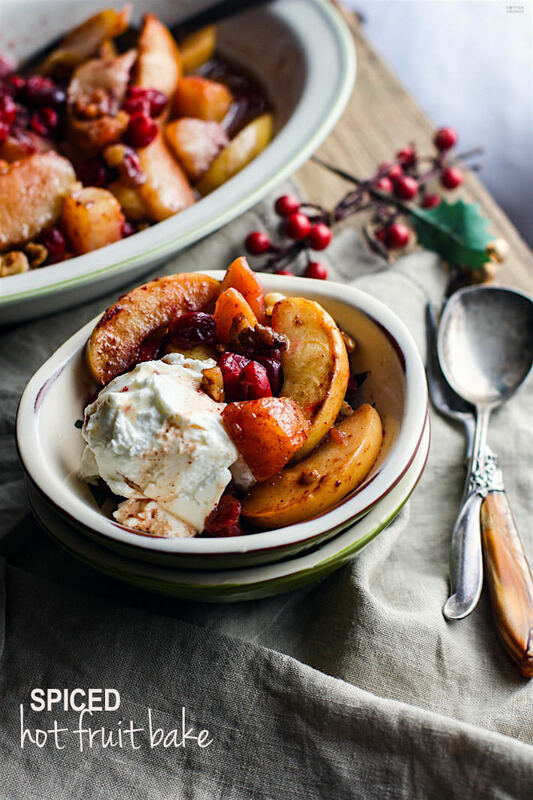 Tastes completely like a cobbler or fruit crumble without all the other stuff! The aroma this creates while baking is heavenly. Oh i am so glad you liked it! It’s a family favorite here too! Delicious in look..love to taste it! thanks for sharing! My mom made this, too, and I’m so glad I found your recipe! This is a winner! Seriously this! Right out of the oven with a scoop of vanilla ice cream! Love this! It would be great with yogurt or ice cream! Love how when you cook the fruit is brings out their natural sugars! This recipe is one I make year around! Such a great way to use up many fruits. That’s what I love to hear!😆 thank you friend! Such a great breakfast/brunch recipe that I can make any time of the year. SO GOOD! I really loved the flavor combination!